My friend Bruce Budy did an excellent write up for the 7th race of the Spring Series. We spent last evening sailing along in a stiff breeze, but nothing like we now learn was all around us! Apparently some very violent hails storms were crashing down to the east and south. We were all apprehensive, as we could see the dramatic clouds and listen to the radios with their dire warnings, but we agreed it was, “just fine”, for racing. “If the weather did turn nasty, it was every man for himself.” Dan and Mary Griggs, on Mjolnir, were in the channel as we headed out, cursed with a rigging problem, so we offered to tow them to the course while they fixed it. This led to some exciting maneuvers, as the wind was about 15 kts, but we managed to get them going after bouncing off the tire wave breaks along the dock a few times. During the pre-start we considered reducing sails with a reef, but saw few others with reefs, so decided to stay full. The course was 3-5-6, and we had a great start, right on the mark with full steam as the horn blew. However, we were at the pin end and the Boat end was favored..and therefore very crowded. We were happy to be in pretty good air and forging ahead, albeit facing a tack across the fleet to get to the right side. 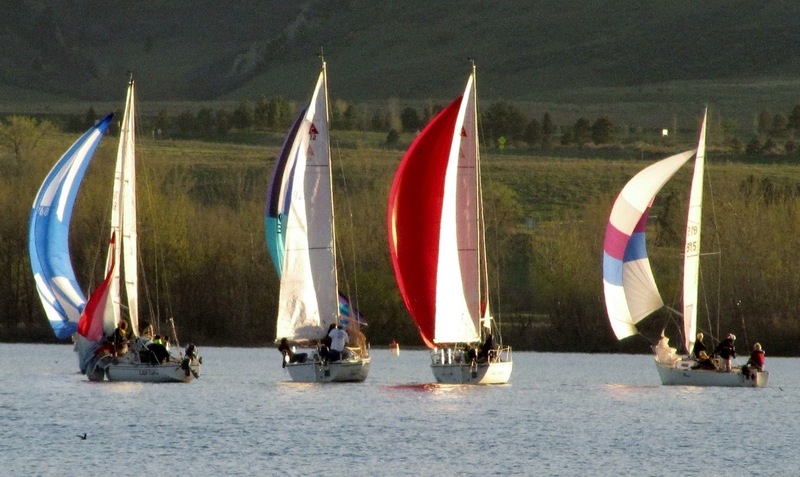 (The first leg is usually dead into the wind, and thus requires tacking to right and left. Those tacking to the right, on ‘Starboard’, have the right of way.) Paradiso, (a Hunter 26.5, rated faster in the handicap), was ahead, Moku, (an identical boat, with, of course, the same rating), off of our starboard quarter and Manana, (a Merit 23, rated slower), behind him several lengths. The rest of the fleet was mobbing along after us and on our right. Eventually the window opened and we tacked, managing to slice across, either narrowly astern or ahead of the rest. No dips, no hits, no errors. Moku tacked moments later, now blocking our left, as we raced to the lay line.Paradiso had tacked later and was still well ahead, Manana now off Moku’s port quarter. Moku of course held us as long as possible, but finally tacked toward #3. (The rules don’t allow one to tack immediately in front of another and force him to change course.) We tacked soon after, in time to watch with glee as Moku had to dip behind Manana, and Manana tacked before crossing us. We all arrived in a sort of jumble at #3, Sapphire, (a boat identical to Paradiso), having also arrived from somewhere. That was the start of a very amazing leg. Paradiso held his lead, we were slightly ahead of Moku, and Sapphire was just abeam, all off to our left several lengths. “Amazing”, because we were all four wing on wing, (Head and Main sails spread to opposite sides of the boat), for the entire leg, and quite equal in speed. It is rare for a breeze to hold that steady in strength and direction at Chatfield, but there we were. It seemed to go on forever, as each of us would inch forward, then back. Sorry to see the spectacle end, we all four arrived at #5, still only a length or two apart, except for a several length advantage for Paradiso. Manana had fallen back during the downwind sprint. Of course heading back up into the wind we discovered its strength. The rails were down as the Paradiso and Sapphire headed left. We were followed by Moku toward the shoreline to the right. Our hope was to get slightly reduced winds along the shore, and we did. Not only that, when we were forced to tack a few lengths off the beach, we realized we were now on a much higher lift, while Paradiso and Sapphire were fighting the wind out in the middle of the lake. That was a nice moment. As we raced up the lake we had Sapphire well off to our left, Moku steaming along several lengths behind, and Paradiso now on his tack toward #6 somewhere ahead. With his boat rated so much faster, we were quite pleased to see he was about the same distance ahead as he had been at #3. Only Manana had lost ground since that earlier mob gathering. We learned later he had suffered a knockdown, without injury, but killing his race. Larger boats have a distinct advantage in heavier winds. We reached our layline for #6 and tacked behind Paradiso, still several lengths ahead. The wind was building and we were all on the ragged edge, with whoops and hollers, as we closed on the final rounding. Quickly around, we continued our chase after Paradiso toward the finish line. The wind was even stronger and it was a vigorous final leg. Paradiso crossed with a horn blast from the Committee Boat. We could hear the horn, but could not see him on the other side of our headsail. We had set a course for the Committee Boat, but now realized the pin end was closer and veered off in the final seconds to cross the line sooner near the pin. Horn! Behind several lengths was Moku, Sapphire farther astern at a respectable distance, and behind them a long trail of tales of woe. It had been a struggle for everyone else, but we three leaders had had a ball! Once ashore with a jubilant Paradiso crew, we compared times. Using our rough scoring, we confirmed it is going to be very close. It will definitely be a matter of seconds, after the 30+ minutes of drama, but it appears right now that we will have the edge and retain our lead in points. If Paradiso won, we will be tied for first in the Series. Moku retains position. This was a close one. In real time Kaija was 2nd, by 55 seconds. After calculating the handicap, the calculated margin between Kaija and Paradiso was..?? Kaija 31’23” = 31.3833’ X .971 (cf) = 30.4732 = 30’ 29“ decimal rounded up to full second. Kaija finished in 30.4732 minutes corrected time. Paradiso “ “ 30.4666 minutes “ “ . Margin of victory .0066 seconds = 66 /1,000 of a second !!! The margin of victory is well within the bounds of human error. I’m glad we have a few more to go to before we determine the series winner! Thanks for a great account of the race.